What to do with a bunch of apples rolling around in the crisper? 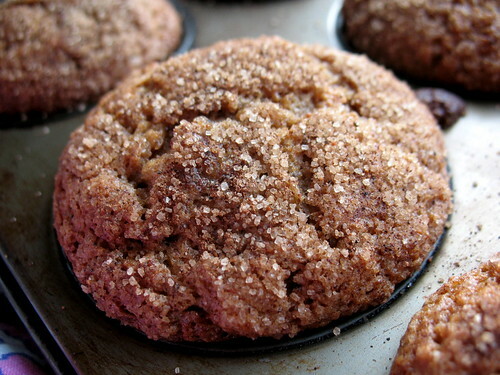 Well, make apple muffins, of course! You can use store bought unsweetened apple sauce if you wish, but I often make my own when I have some strays hanging around in the crisper. Apple sauce is easy! You can follow the directions here (omitting the blackberries and maple syrup). These muffins turned out deliciously spicy with a crunchy top, and when I took them to school for the breakfast program they were gone in no time. With the use of applesauce instead of milk, they were far lower in dairy than some muffin recipes, too. You can add whatever kind of nuts you want, or just leave them out. Pre-heat the oven to 400 F. You can line your muffin tin with paper cups, or grease the tin if you wish. In a large bowl, whisk the flour, baking powder, baking soda, cinnamon, allspice, nutmeg, and salt together. Set aside. In a separate bowl, whisk the eggs, applesauce, brown sugar, and melted butter together. Pour over the dry ingredients and stir until just combined. Fold in the nuts. Spoon the batter into muffin cups. In a little bowl, stir together the topping ingredients and then sprinkle over top of the batter in the muffin cups. I like using Sugar in the Raw for topping because it's coarser and gives a nice crunch, but regular sugar works well too. Bake in the center of the oven for about 20 minutes, until a toothpick inserted into the center comes out clean. Remove from the oven and allow the muffins to sit in the pan for about 5 minutes before removing them to a rack on the counter.